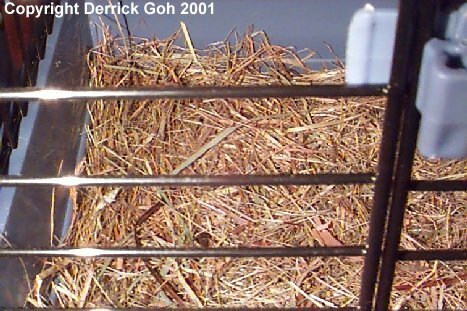 Peter Gurney (a UK cavy expert) recommends using hay as bedding. By all means use hay as bedding but not by itself. This is 'cos hay is not absorbant. Under the hay you should use either newspapers or some other bedding. If you use newspapers under the hay, you need to change both the hay & newspapers daily 'cos newspapers get soaked quickly. If you use shavings or CareFresh under the hay, you can afford to replace them every other day or so. The purpose of the hay is to help keep them dry so if you're gonna be stingy with the hay, its not going to work! At least 3 cm of hay will keep them off the wet bedding below. However most cavies love to dig so the more hay the better! Remember, the whole idea is to have enough hay to seperate them from the wet bedding. Don't just dump the hay from the bag into the cage. This is 'cos it tends to have lots of hay dust & even soil. These may cause your cavies to start sneezing so get rid off as much as possible. I usually throw the hay about on the floor & the dust & soil will fall off, making it easier for me to "filter" out the dust & soil. Oat & orchard grass hays are kind of costly to be used as part of the bedding so that leaves you with timothy & meadow hays. Oxbow timothy is very soft but costs more. Kaytee & 8 in 1 timothy hays are cheaper but tend to be harder. This is bad 'cos your cavies may poke their eyes especially if you give a thick layer of hay. Therefore I'd say that meadow hay is the best choice for part of your bedding. Not only is it very soft, but its also the cheapest. 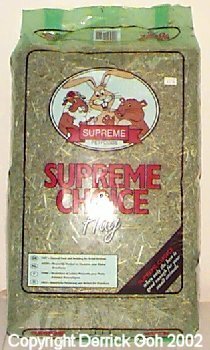 A 1kg bag of Vitakraft alpine meadow hay costs $10 while a 2.5 kg bag of Supreme Choice Hay costs $6.80. Both are meadow hay except Vitakraft's is more costly & smells much nicer. 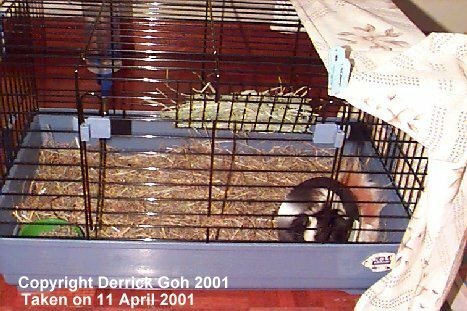 When Oreo had to be seperated from the other 2 after her operation, I placed her in a plastic bottom cage. The vet adviced that shavings not be used since her operation "wound" hadn't healed yet. 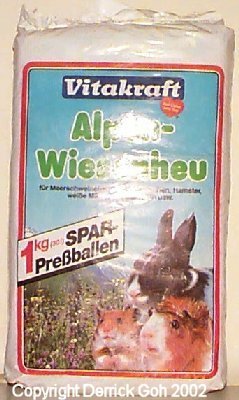 So I used 20 sheets of newspapers & covered that with tons of Vitakraft alpine meadow hay. In fact I used up the entire bag in 2 weeks! I can't emphasise this enough, you have to give enough hay or else it defeats the purpose! You need enough hay to seperate your cavies from the wet newspapers below. I changed the newspapers & hay daily & although the newspapers were wet, I felt that the hay did quite a good job keeping Oreo dry 'cos the hay was only mildly damp at certain areas. But due to the humid environment here, the newspaper is not going to dry so you have to change it daily. I find the texture of meadow hay to be better than other types of hay & since its the cheapest, even more reason to use meadow hay! Straw is an alternative bedding to hay but chose hay which is soft. There have been cases of cavies getting eye injuries from being poked by straw. As with using hay as bedding, do not use straw alone as bedding & make sure you use lots of it. Not very good at absorbing moisture.